, an eminent Scotch lawyer and antiquary, and brother to the preceding, was born in Edinburgh on the 28th of October 1726, and was educated at Eton school, where he was distinguished no less for his acquisitions in literature-than for the regularity of his manners. From Eton he was removed, to complete his studies at Utrecht, where he remained till 1746. In 1748 he was called to the Scotch bar, where, notwithstanding the elegant propriety of the cases which he drew, his success did not answer the expectations which had been formed of him. This was not owing either to wajjt of science or to want of industry, but to certain peculiarities, which, if not inherent in his nature, were the result of early and | deep-rooted habits. He possessed on all occasions a sovereign contempt, not only for verbal antithesis, but for well-rounded periods, and every thing which had the semblance of declamation; and indeed he was wholly unfitted, by an ill-toned voice, and ungraceful elocution, for shining as an orator. It is not surprizing, therefore, that his pleadings, which were never addressed to the passions, did not rival those of some of his opponents, who, possessed of great rhetorical powers, did not, like him, employ strokes of irony too fine to be perceived by the bulk of any audience, but expressed themselves in full, clear, and harmonious periods. Even his memorials, though classically written, and often replete with valuable matter, did not on every occasion please the court; for they were always brief, and sometimes, it was said, indicated more attention to the minutiye of forms than to the merits of the cause. Yet on points which touched his own feelings, or the interests of truth and virtue, his language was animated, his arguments forcible, and his scrupulous regard to form thrown aside. He was on all occasions incapable of misleading the judge by a false statement of facts, or his clients, by holding out to them fallacious grounds of hope. The character indeed which he had obtained for knowledge and integrity in the Scotch law, soon raised him to an eminence in his profession. Accordingly, in March 1766, he was appointed one of the judges of the court of session with the wannest approbation of his countrymen; and in May 1776 he succeeded to the place of a lord commissioner of the justiciary on the resignation of lord Coalston, his wife’s father. Upon taking his seat on the bench he assumed the title of lord Hailes, in compliance with the usage established in the court of session: this is the name by which he is generally known among the learned of Europe. Nos. 140, 147, 204, were written by lord Hailes. The Remarks on the Tatlers, in volume LX. pp. 679, 793, 901, 1073, 1163, were by lord Hailes. His too was the critique in volume LXI. 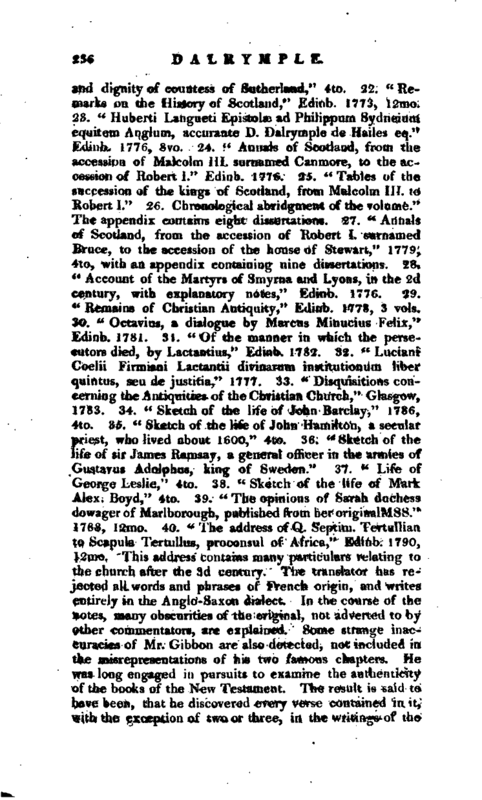 p. 399, on the famous Miniature of Milton, in the possession of sir Joshua Reynolds, which produced from the pen of our English Raphael the vindication of it in the same volume, p, 603, and the reply of lord Hailes, in p. 886.—The Edinburgh Magazine was also frequently enriched by his communications. and other publications of like nature, he allotted some part of his time to the illustration and defence of primitive Christianity. 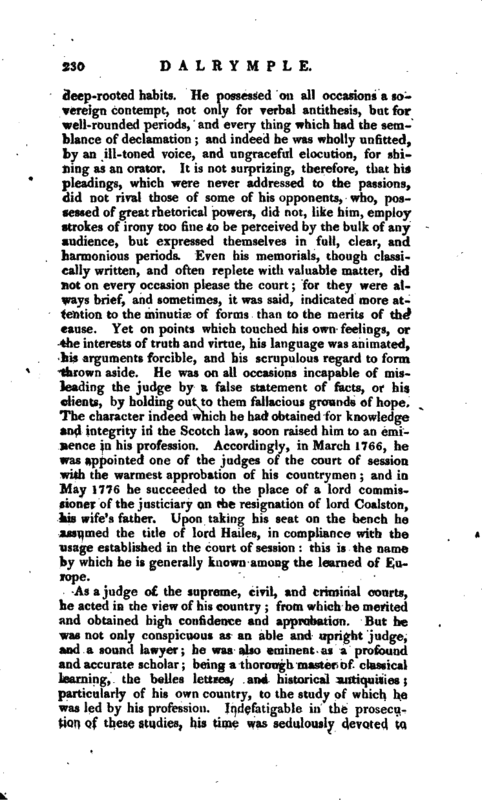 In 1771 he composed a very learned and ingenious paper, or law-case, on the disputed peerage of Sutherland. He was one of the trustees of the lady Elizabeth, the daughter of the last earl, and being then a judge, the names of two eminent lawyers were annexed to it. In that case, he displayed the greatest accuracy of research, and the most profound knowledge of the antiquities and rules of descent, in that country; which he managed with such dexterity of argument, as clearly established the right of his pupil, and formed a precedent, at the same time, for the decision of all such questions in future. In 1773 he published a small volume, entitled “Remarks on the History of Scotland.” Tnese appeared to be the gleanings of the historical research which he was making at that time, and discovered his lordship’s turn for minute and accurate inquiry into doubtful points of history, and at the same time displayed the candour and liberality of his judgment. 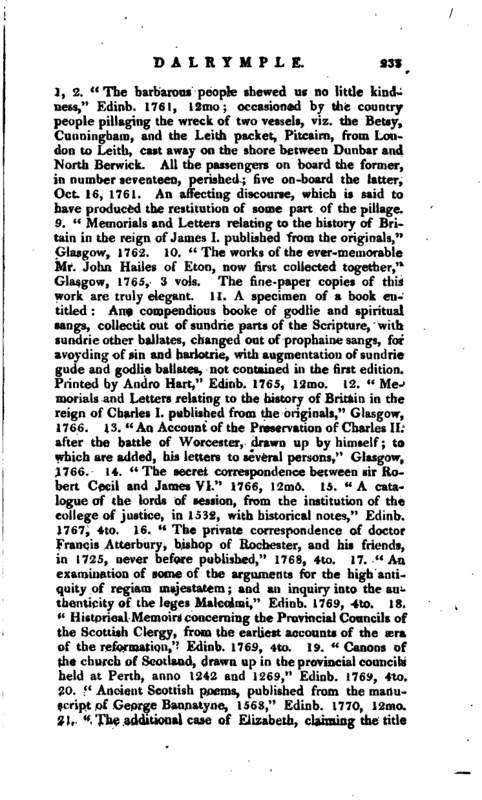 This publication prepared the public for the favourable reception of the Annals of Scotland, in 2 vols. 4to, the first of which appeared in 1776, and the second in 1779, and fully answered the expectations which he had raised. The difficulties attending the subject, the want of candour, and the spirit of party, had hitherto prevented the Scotch from having a genuine history of their country, in times previous to those of queen Mary. Lord Hailes carried his attention to this history, as far back as to the accession of Malcolm Canmore, in 1057, and his work contains the | annals of 14 princes, from Malcolm III. to the death of David II. Aiul happy it was that the affairs of Scotland attracted the talents of so able a writer, who to the learning and skill of a lawyer, joined the industry and curiosity of an antiquary; to whom no object appears frivolous or unimportant that serves to elucidate his subject. 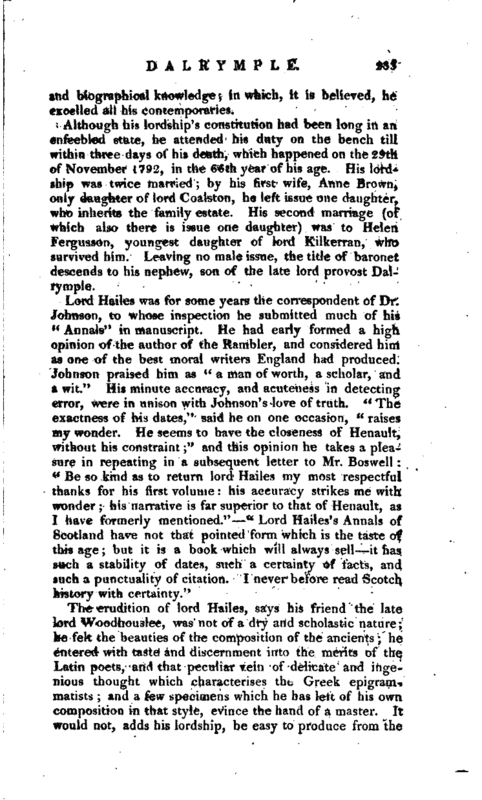 Lord Hailes has so well authenticated his work by references to historians of good credit, or deeds and writings of undoubted authority, and has so happily cleared it from fable, uncertainty, and conjecture, that every Scotchman, since its appearance, has been able to trace back with confidence, in genuine memoirs, the history of his country for 736 years, and may revere the memory of the respectable judge, who with indefatigable industry, and painful labour, has removed the rubbish under which the precious remains were concealed. Lord Hailes at first intended, as appears by an advertisement prefixed to his work, to carry down his annals to the accession of James I. but, to the great disappointment of the public, he stopped short at the death of David II. and a very important period of the history still remains to be filled up by an able writer. 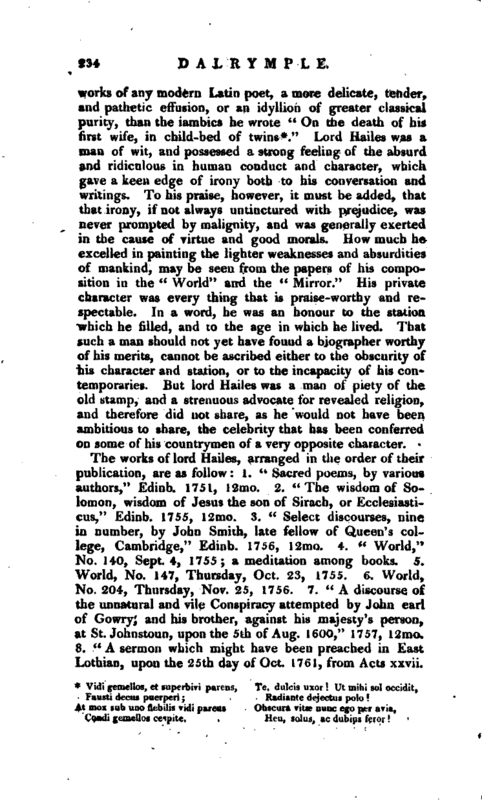 Lord Hailes’s Annals of Scotland, it is believed, stand unrivalled in the English language, for a p irity and simplicity of style, an elegance, perspicuity, and conciseness of narration, that peculiarly suited the form of his work; and is entirely void of that false ornament, and stately gait, which makes the works of some other writers appear in gigantic but fictitious majesty. 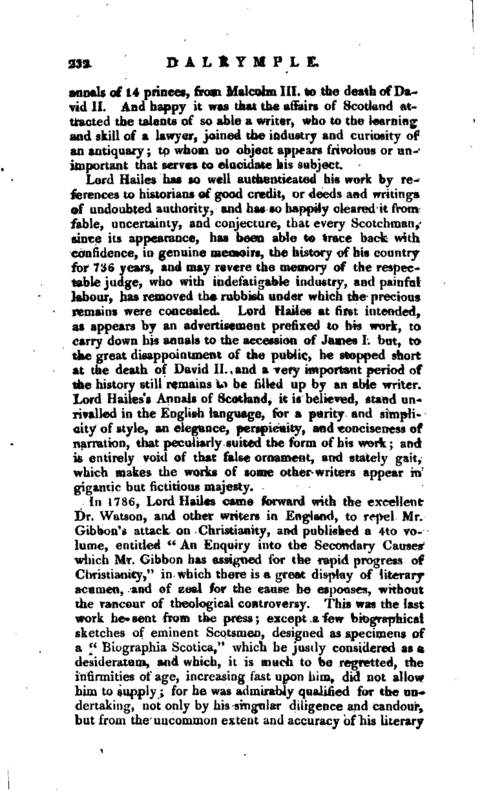 in 1786, Lord Hailes came forward with the excellent Dr. Watson, and other writers in England, to repel Mr. Gibbon’s attack on Christianity, and published a 4to volume, entitled “An Enquiry into the Secondary Causes which Mr. Gibbon has assigned for the rapid progress of Christianity,” in which there is a great display of literary acumen, and of zeal for the cause he espouses, without the rancour of theological controversy. Tins was the last work he sent from the press; except a few biographical sketches of eminent Scotsmen, designed as specimens of a “Biographia Scotica,” which he justly considered as a desideratum, and which, it is much to be regretted, the infirmities of age, increasing fast upon him, did not allow him to supply; for he was admirably qualified for the undertaking, not only by his singular diligence and candour, but from the uncommon extent and accuracy of his literary | and biographical knowledge; in which, it is believed, he excelled all his contemporaries. Although his lordship’s constitution had been long in an. enfeebled state, he attended his duty on the bench till within three days of his death, which happened on the 29th of November I7b>2, in the 66th year of his age. His lordship was twice married; by his first wife, Anne Brown, only daughter of lord Coalston, he left issue one daughter, who inherits the family estate. His second marriage (of which also there is issue one daughter) was to Helen Fergusson, youngest daughter of lord Kilkerran, who survived him. 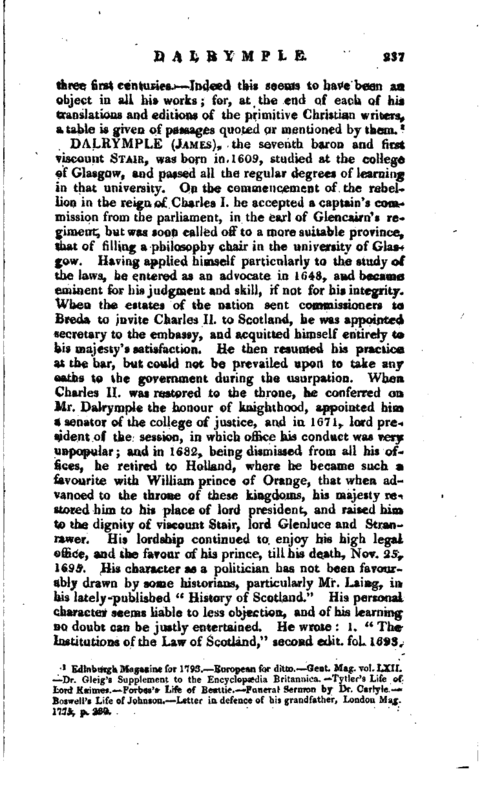 Leaving no male issue, the title of baronet descends to his nephew, son of the late lord provost Darrymple. The erudition of lord Hailes, says his friend the late lord Woodhousiee, was not of a dry and scholastic nature; he felt the beauties of the composition of the ancients; he entered with taste and discernment into the merits of the Latin poets, and that peculiar vein of delicate and ingenious thought which characterises the Greek epigrammatists; and a few specimens which he has left of his own composition in that style, evince the hand of a master. It would not, adds his lordship, be easy to produce from the | works of any modern Latin poet, a more delicate, tender, and pathetic effusion, or an idylliou of greater classical purity, than the iambics he wrote “On the death of his first wife, in child-bed of twins*.” Lord Hailes was a man of wit, and possessed a strong feeling of the absurd and ridiculous in human conduct and character, which gave a keen edge of irony both to his conversation and writings. To his praise, however, it must be added, that that irony, if not always untinctured with prejudice, was never prompted by malignity, and was generally exerted in the cause of virtue and good morals. How much he excelled in painting the lighter weaknesses and absurdities of mankind, may be seen from the papers of his composition in the “World” and the “Mirror.” His private character was every thing that is praise-worthy and respectable. In a word, he was an honour to the station which he filled, and to the age in which he lived. That such a man should not yet have found a biographer worthy of his merits, cannot be ascribed either to the obscurity of his character and station, or to the incapacity of his contemporaries. But lord Hailes was a man of piety of the old stamp, and a strenuous advocate for revealed religion, and therefore did not share, as he uould not have been ambitious to share, the celebrity that has been conferred on some of his countrymen of a very opposite character. The works of lord Hailes, arranged in the order of their publication, are as follow: 1. “Sacred poems, by various authors,” Edinb. 1751, 12mo. 2. “The wisdom of Solomon, wisdom of Jesus the son of Sirach, or Ecclesiasticus.” Edinb. 1755, 12mo. 3. “Select discourses, nine in number, by John Smith, late fellow of Queen’s college, Cambridge,” Ediub. 17 06, 12mo. 4. “World, 1 * No. 140, Sept. 4, 1755; a meditation among books. 5. World, No. 147, Thursday, Oct. 23, 1755. 6. World, No. 204, Thursday, Nov. 25, 1756. 7.” A discourse of the unnatural and vile Conspiracy attempted by John earl of Go wry, and his brother, against his majesty’s person, at St. Johnstoun, upon the 5th of Aug. 1600,“1757, 12mo. 8.” A sermon which might have been preached in East Lothian, upon the 25th day of Oct. 1761, from Acts xxvii. Heu, solus, ac dubius feror! 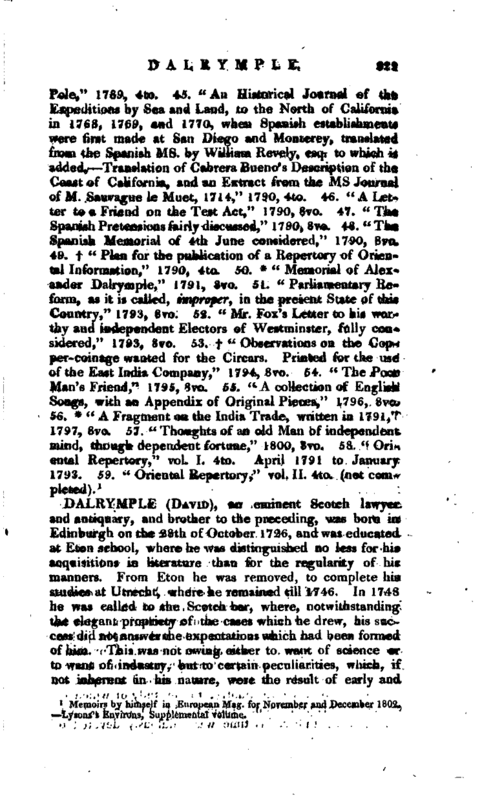 Edinburgh Magazine for 1793. European for ditto. —Gent. Mag. vol. LXIL Dr. Gleig’s Supplement to the Encyclopaedia Britannica. Tytler’s Life of Lord Kaimes. Forbes’s Life of Beattie. Funeral Sermon by Dr. Carlyle. —Boswell’s Life of Johnson. Letter in defence of his grandfather, London Mag. 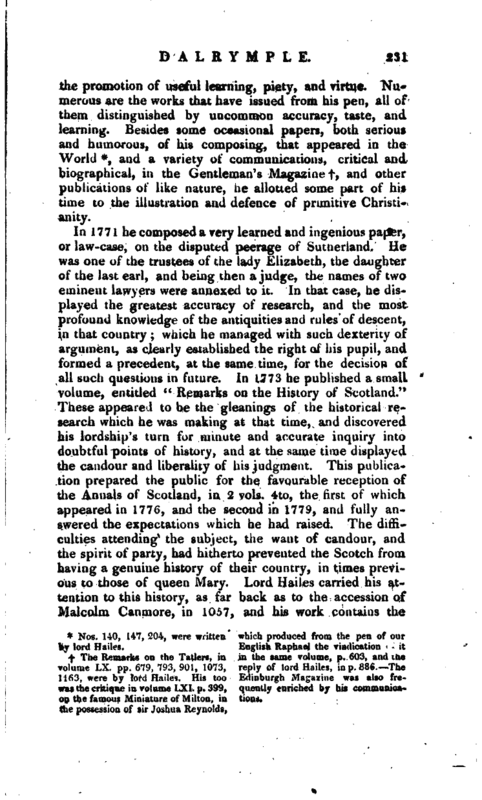 1775, p. 330.